Heaving is problem in some alfalfa stands each year in the Midwest. Heaving occurs on heavy soils that have high moisture contents. Repeated freezing and thawing causes soil expansion and contraction that pushes the tap-rooted plants (and fence posts) out of the soil. The need to push against something is why grasses with fibrous root systems are not affected by heaving and older alfalfa stands (with larger taprooted plants) are more affected by heaving than younger stands. Where heaving is observed, first dig a few plants to determine if the taproot is broken. Plants with broken taproots will likely green up and survive for a short time and then die when weather becomes warm and the soil dries. The length of time before plant death will depend on the length of taproot above the break and will range from greenup only (if tap root broken three to four inches below the soil surface) to sufficient growth for first crop (6 to 8 inches taproot) to growth until first dry spell (8 to 12 inches taproot). Fields with over 1.5 inches heaving will likely have broken taproots and will also suffer significant damage from harvesting equipment. These fields should likely be terminated immediately. Fields with 1 inch or less heaving are likely to have unbroken taproots and may be salvageable for at least the current year. These fields will likely have delayed greenup. The best recommendation is to do nothing to the stands now. Do not go over the field with a roller or cultipacker in early spring to push the crowns back into the soil. This will likely to do more damage than good. Plan on harvesting these fields later than normal (25% bloom) and to raise cutter bar at harvest sufficiently to clear crowns. Natural settling should occur during the year and, if plants are reseated, stands should survive until next year. Stands entering the winter with elevated crowns are likely to suffer above average winter injury and kill. Heaving is always worse in soils with good moisture content. The most practical method of reducing heaving in future years is to leave some residue on the soil surface over winter. Residue reduces heaving by insulating the soil and reducing the number of times freezing and thawing occurs. Fields not harvested last fall will usually have less heaving that those with fall growth removed. Heaving in future years can also be minimized by having good internal and surface drainage. Tiling may reduce heaving problems depending on the depth of the tile. 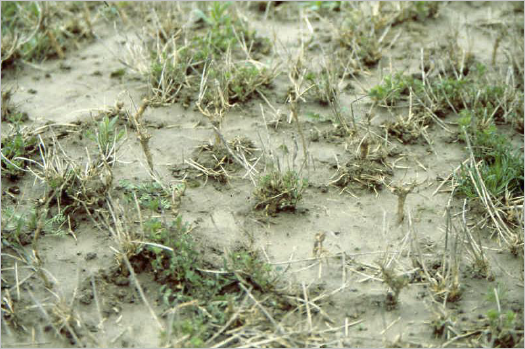 Planting a grass with the alfalfa has been shown to reduce, but not eliminate, heaving of the alfalfa in the stand. There no indication of genetic variation in alfalfa varieties for difference in heaving, even the ‘fibrous rooted’ types.